One of the things I have loved about being a mom is rediscovering past loves through my daughter's eyes. I loved the theatre growing up and was involved with numerous plays. My Mom and I would take in shows from time to time. But as I grew and left home theatre was one of those things that fell to the way side. Then comes Mouse and at a young age of three, she tells me she wants to be on stage. At that time I was running and judging pageants so she did the baby pageant circuit. (Go ahead judge on that one, if it makes you feel better the pageant circuit in MN is really just one) Then she caught the theatre bug at 4. There is a community theatre where we live that is for 4 - 6th graders. She has been working her way up from chorus to one of the leads (so proud). But she also has a love for the art of theatre. We take in a few shows a year. It has been great to get back into this past love and to see it with new eyes. 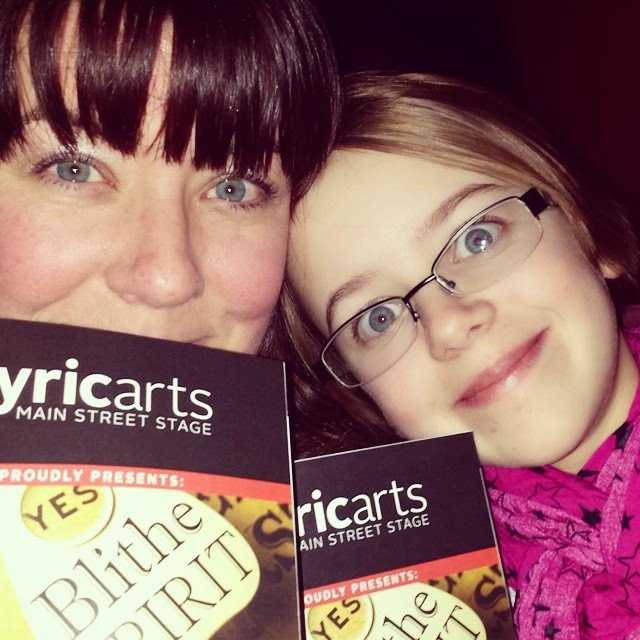 Last night we went with my Mom to watch Blithe Spirit, my friend Allie had the lead. Listening to Mouse laugh and gasp through out the play was so much fun. Now, I just have to find ways to keep encouraging this dream of hers. Love your post....my daughter is only 5 but I feel myself, as you say, revisiting past loves with her....and I know how you must have felt, needing to help your daughter follow her callings, as my daughter (even though she is just 5) has very set ideas about what she wants to do with her life and what her likes and dislikes are! It's so good to read about such a supportive Mum! Well done to your daughter for channelling her passion so constructively!